Bottom Line: The US has been producing new record-high levels of GDP in almost every quarter since Q3 2011, and we are now producing 7.65% (and $1.14 trillion) more real GDP today than in late 2007. But we are producing that record-setting level of real output with a quarter-million fewer workers than in 2007. One explanation for America’s record-high output with 227,000 fewer workers is that the Great Recession facilitated what might be one of the greatest expansions of worker productivity in US history. The fact that we’ve been able to greatly expand national output with fewer inputs (workers) represents a huge increase in economic efficiency, but has also left us with a lingering “jobless recovery” and an economy that is struggling to create new, post-recession employment opportunities for millions of Americans. Labor force participation remains low. Perry explains that he is using the “more comprehensive measure of total civilian employment” instead of the total payroll number, which recently climbed up to pre-recession levels However, his bigger point is supported by the troubling increase in the working age population during that time. 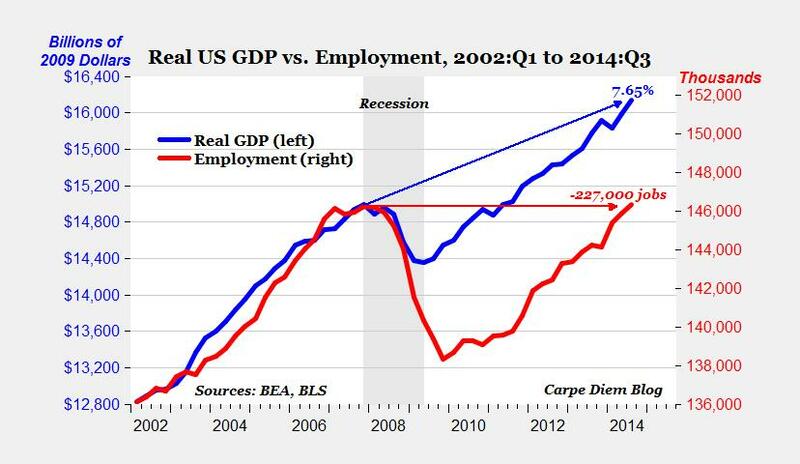 Mark J. Perry, “The current state of the US economy in one chart”, Carpe Diem, September 5, 2014. What will happen when computers can handle most white-collar jobs? Computers may soon be able to do white-collar jobs meant for college graduates. Noriko Arai of the Todai Robot Project explains how the future is shaping up. … a machine should be capable, with appropriate programming, of doing many — perhaps most — jobs now done by university graduates. With the development of artificial intelligence, computers are starting to crack human skills like information summarization and language processing…. How would college graduates be affected by this technological evolution? There is a significant danger, Ms. Arai says, that the widespread adoption of artificial intelligence, if not well managed, could lead to a radical restructuring of economic activity and the job market, outpacing the ability of social and education systems to adjust. Intelligent machines could be used to replace expensive human resources, potentially undermining the economic value of much vocational education, Ms. Arai said. In such a scenario, high-salary jobs would remain for those equipped with problem-solving skills, she predicted. But many common tasks now done by college graduates might vanish. Mostly good or mostly bad? … A recent study published by the Program on the Impacts of Future Technology, at Oxford University’s Oxford Martin School, predicted that nearly half of all jobs in the United States could be replaced by computers over the next two decades. Others are less sanguine. Noriyuki Yanagawa, professor of economics at Tokyo University, says that Japan, with its large service sector, is particularly vulnerable. Smart machines will give companies “the opportunity to automate many tasks, redesign jobs, and do things never before possible even with the best human work forces,” according to a report this year by the business consulting firm McKinsey. Many business leaders dismiss a takeover by machines as “futurist fantasy”. … Gartner’s 2013 chief executive survey, published in April, found that 60 percent of executives surveyed dismissed as “‘futurist fantasy” the possibility that smart machines could displace many white-collar employees within 15 years. Will these changes create a future of leisure and “self-realization”? Optimists say this could lead to the ultimate elimination of work — an “Athens without the slaves” — and a possible boom for less vocational-style education. Mr. Brant’s hope is that such disruption might lead to a system where individuals are paid a citizen stipend and be free for education and self-realization. It sounds too good to be true. Although the concept of a future as an “Athens without the slaves” has its appeal, it sounds too fantastic to believe. I wonder what will happen to the segment of the population that lacks the highest level of problem-solving skills. Michael Fitzpatrick, “Computers Jump to the Head of the Class”, New York Times, December 29, 2013. 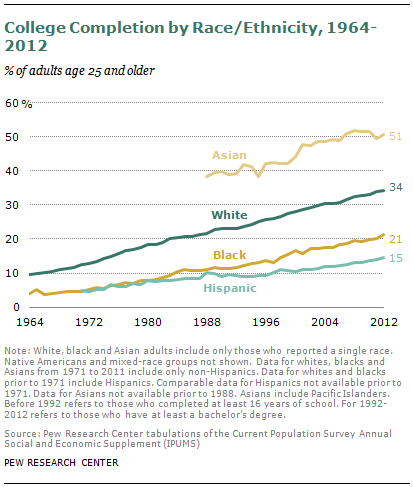 College graduates continue to fare the best in this feeble economic recovery. College graduates claimed the bulk of last month’s job gains, while high-school grads with no college lost jobs, highlighting a persistent divide in the recovery. While both groups have seen improvements in unemployment rates, 3.4% for college grads and 7.3% for high school grads with no college, there is general agreement that progress has been slow. … Of course, though college grads are getting the lion’s share of the jobs, it doesn’t mean those are good jobs. Overall employment gains have come from lower wage jobs, with many graduates underemployed. The divergence in jobs growth is clear. Among all segments of workers sorted by educational attainment, college graduates are the only group that has more people employed today than when the recession started. Are we seeing a convenient confluence of moms wanting to work less with a surge in part-time jobs? Headlines continue to remind us of the surge in part-time employment. According to a recent Pew poll, 67% of all mothers would ideally forego full-time work in favor of working part-time (47%) or not at all (20%). By contrast, only 25% of fathers would choose part-time work (15%) or not to work (10%). Among all women who describe themselves as “financially comfortable,” only 31% would ideally work full-time and another 34% wouldn’t work at all. And among married mothers, only 23 percent would ideally like to work full-time. These are large percentages of different types of women who would choose family or personal priorities over full-time employment. Current labor statistics bear out these fantasies: women are twice as likely as men to work part-time even though they are also more likely to be college-educated and thus more marketable. Of course, part-time employment does not work as a solution for everyone. It’s true that the trend toward part-time, benefit-free employment can be financially ruinous to individual workers. 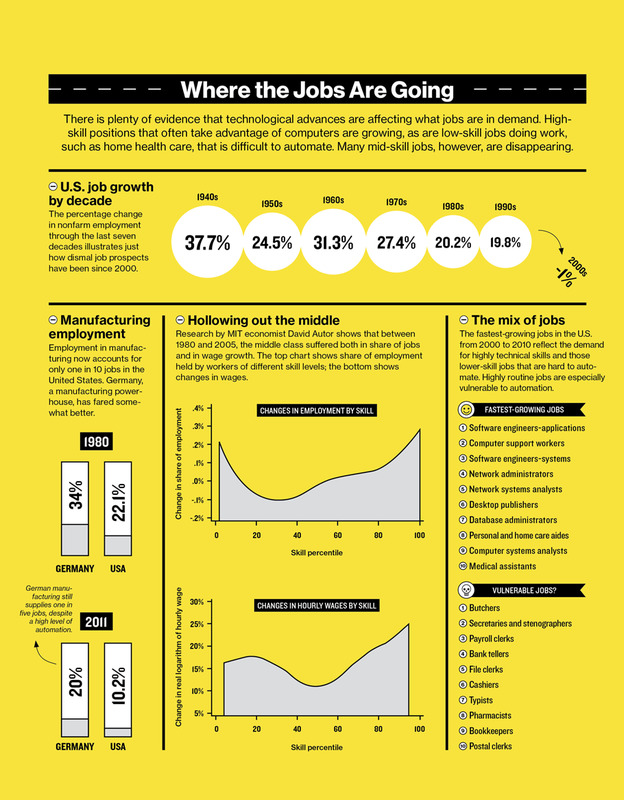 One fifth of the country’s jobs are part-time, and many are low-skilled, dead end positions. But it’s easy to overlook how unrewarding full-time employment can be for many people, too – especially when the researchers and reporters and pundits who write about workforce trends tend to have fascinating, flexible jobs with decent pay. Moms who want to cut down their working hours may look more attractive to employers. I just wonder if there may be a glimmer of hope for mothers wanting to downsize their work week, but who have not been able to find suitable part-time opportunities. The new economics of employing part-time workers creates an environment that dissolves some of the old arguments used to defend policies requiring every staff member to put in 40+ hours per week. Now the parent who wants to spend less time at the office and more time at home may be a more attractive job candidate. On the topic of sluggish jobs growth, Megan McArdle says our stubborn unemployment problem is rooted in “technology and trade”. … Global shipping and trade liberalization has made it more practical to manufacture in low wage countries. Meanwhile, in high wage countries, technology is substituting for labor. At its peak, General Motors employed 600,000 people to make slightly less than half the cars in the country. Today it employs 77,000 to produce about 1/5th the cars on the US market. Even if it regained the market share it has lost to imports, employment in the industry would be way down. Remember this chart of the hollowed out middle class? But the lower class is also on shaky ground. Highly skilled individuals who are motivated and persistent will always find ways to support themselves. But there is a surplus of workers for middle class jobs McArdle describes as “seated, skilled, steady, decently paid”. And while large numbers of low-skill jobs continue to be created, these “jobs are, on average, pretty unattractive ones”. They are generally low statue, and sometimes miserable. In some cases, our government safety net is a more attractive alternative to these low-end jobs. The “majority of the population” may be in for a long struggle. … we are not creating a lot of good new jobs–defined as jobs that are relatively secure, physically tolerable, and decently paid. People with enough grit and imagination can invent themselves new jobs, but at no time in history has that described the majority of the population. The alternatives for the rest aren’t very attractive. And since modern-day America tries hard to keep people from becoming truly desperate, those jobs aren’t being created. McArdle points out that part of the problem is cultural, with families and communities undergoing massive changes that break with traditional attitudes towards work. And education is not a solution by itself. … Until roughly the last five years, it was possible to believe that education would be the solution: send more kids to school, retrain people for new jobs. 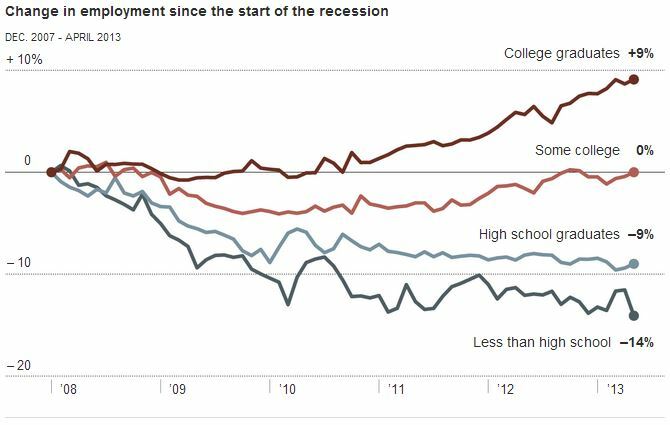 But college graduates aren’t finding it so easy to obtain solid employment either. It’s true that having a college diploma is still much better than not having a college diploma, but that doesn’t mean that by sending more kids to school, we’re actually making the workforce more productive, much less mitigating the problem of economic change; we may just be forcing people to jump over a higher bar to gain access to a shrinking number of jobs…. A stronger safety net does not seem like a good solution. For starters, it is politically difficult to imagine a really large class of people who simply permanently live off the state. The safety net is rooted in human instincts about reciprocal exchange. … They will lose political support if you have one group of people paying taxes, and a different group of people who can expect to live their entire life on the dole. Such an arrangement would also be socially toxic. Being out of work is astonishingly bad for your state of mind, your social relations, and even basic skills like math and reading…. Glenn Reynolds does not think it’s a temporary problem. There’s a lot of flailing going on, and there has for years been insufficient concern about what all the folks on the left half of the bell curve are going to do with their lives — only now it’s looking like the left 2/3 or maybe 3/4. I’m not sure what to do either. … I do think there’s something structural going on, not just an economic cycle. Total household debt continues to decline, but rise in student debt hampers economic recovery. The total amount of debt held by Americans fell again in the first three months of the year and stood at the lowest level since the middle of 2006, the New York Federal Reserve said Tuesday…. The level of household debt in the first quarter fell by $110 billion, or 1%, to $11.23 trillion, mainly because consumers reduced mortgage balances and used their credit cards less. Auto and student loans rise. The increase in the value of auto loans was the smallest in four quarters, suggesting that car companies might have cut prices to attract buyers as demand for new vehicles slackened. Still, auto loans rose $11 billion to $794 billion to mark the ninth straight quarterly gain. Student loans have ‘surged 46% since the end of the recession’. Student loans, which climbed $20 billion in the first quarter, have surged 46% since the end of the recession to an all-time high of $986 billion. More students are going to college or remaining in school longer to obtain graduate degrees to improve their chances of finding a job amid a slow economic recovery. Yet the escalation in student loans is also leaving many young people saddled with large debts. Although the delinquency rate on student loans fell slightly in the first quarter to 11.19%, that’s still the second highest rate ever. Before the recession, delinquencies averaged around 7%. The decline in household debt is good for a recovering economy, but economists believe growing student loans are ‘acting as a drag on growth’. The anemic economy has left millions of younger working Americans struggling to get ahead. The added millstone of student loan debt, which recently exceeded $1 trillion in total, is making it even harder for many of them, delaying purchases of things like homes, cars and other big-ticket items and acting as a drag on growth, economists said. The college premium is derived from several elements. Bryan Caplan has written extensively on this topic, including a recent post about how ‘stronger students typically choose harder – and more lucrative – majors’. Economists usually talk about the college premium, but the college premium heavily depends on your major. At the same time, though, stronger students typically choose harder – and more lucrative – majors. Thus, the college premium is doubly infected by ability bias: People who would have made more money anyway are more likely to go to college, and college graduates who would have made more money anyway are more likely to select demanding majors. Incorporating this information, Caplan calculated the premium for various majors. Here are the top five, broken down by gender.